This pie is so easy to make and tastes sooooo good. In the bowl of an electric mixer, beat eggs until foamy. Beat in flour, sugar and brown sugar until well blended. Add in vanilla extract, pumpkin and pumpkin pie spice and mix until combined.. Blend in melted butter. Toss chocolate chips with a sprinkling of flour and fold into batter. Pour into an unbaked 9-inch pie shell. Bake for 55 minutes, or until center is set. 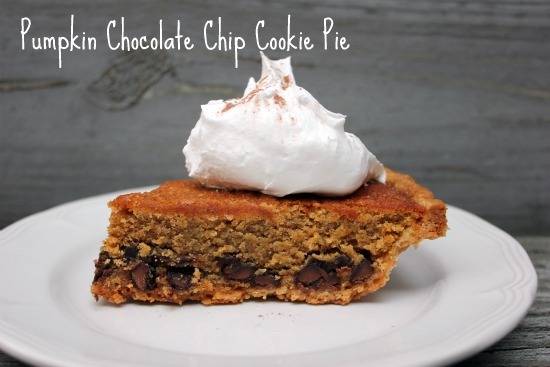 i've never added cookie to pie but this looks fab! love the combo! This makes me want to make pumpkin pie and I don't even like pumpkin pie. Oh my goodness, this looks so good! I think I might serve this next week at our Fall Bash party that I am having!